Transportation in Canada, the world's second-largest country in total area, is dedicated to having an efficient, high-capacity multimodal transport spanning often vast distances between natural resource extraction sites, agricultural and urban areas. Canada's transportation system includes more than 1,400,000 kilometres (870,000 mi) of roads, 10 major international airports, 300 smaller airports, 72,093 km (44,797 mi) of functioning railway track, and more than 300 commercial ports and harbours that provide access to the Pacific, Atlantic and Arctic oceans as well as the Great Lakes and the St. Lawrence Seaway. In 2005, the transportation sector made up 4.2% of Canada's GDP, compared to 3.7% for Canada's mining and oil and gas extraction industries. Transport Canada oversees and regulates most aspects of transportation within federal jurisdiction, including interprovincial transport. This primarily includes rail, air and maritime transportation. Transport Canada is under the direction of the federal government's Minister of Transport. The Transportation Safety Board of Canada is responsible for maintaining transportation safety in Canada by investigating accidents and making safety recommendations. There is a total of 1,042,300 km (647,700 mi) of roads in Canada, of which 415,600 km (258,200 mi) are paved, including 17,000 km (11,000 mi) of expressways (the third-longest in the world, behind the Interstate Highway System of the United States and the China's National Trunk Highway System). As of 2008, 626,700 km (389,400 mi) were unpaved. In 2009, there were 20,706,616 road vehicles registered in Canada, of which 96% were vehicles under 4.5 tonnes (4.4 long tons; 5.0 short tons), 2.4% were vehicles between 4.5 and 15 t (4.4 and 14.8 long tons; 5.0 and 16.5 short tons) tonnes and 1.6% were 15 t (15 long tons; 17 short tons) or greater. These vehicles travelled a total of 333.29 billion kilometres, of which 303.6 billion was for vehicles under 4.5 t (4.4 long tons; 5.0 short tons), 8.3 billion was for vehicles between 4.5 and 15 t (4.4 and 14.8 long tons; 5.0 and 16.5 short tons) and 21.4 billion was for vehicles over 15 t (15 long tons; 17 short tons). For the 4.5 to 15 t (4.4 to 14.8 long tons; 5.0 to 16.5 short tons) trucks, 88.9% of vehicle-kilometres were intra-province trips, 4.9% were inter-province, 2.8% were between Canada and the US and 3.4% made outside of Canada. For trucks over 15 t (15 long tons; 17 short tons), 59.1% of vehicle-kilometres were intra-province trips, 20% inter-province trips, 13.8% Canada-US trips and 7.1% trips made outside of Canada. 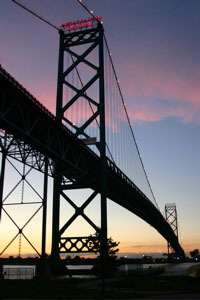 Ambassador Bridge between Windsor, Ontario and Detroit, Michigan has a quarter of US-Canada trade cross over it. Canada's vehicles consumed a total of 31.4 million cubic metres (198 Mbbl) of gasoline and 9.91 million cubic metres (62.3 Mbbl) of diesel. Trucking generated 35% of the total GDP from transport, compared to 25% for rail, water and air combined (the remainder being generated by the industry's transit, pipeline, scenic and support activities). Hence roads are the dominant means of passenger and freight transport in Canada. Roads and highways were managed by provincial and municipal authorities until construction of the Northwest Highway System (the Alaska Highway) and the Trans-Canada Highway project initiation. The Alaska Highway of 1942 was constructed during World War II for military purposes connecting Fort St. John, British Columbia with Fairbanks, Alaska. The transcontinental highway, a joint national and provincial expenditure, was begun in 1949 under the initiation of the Trans Canada Highway Act on December 10, 1949. The 7,821 km (4,860 mi) highway was completed in 1962 at a total expenditure of $1.4 billion. Internationally, Canada has road links with both the lower 48 US states and Alaska. The Ministry of Transportation maintains the road network in Ontario and also employs Ministry of Transport Enforcement Officers for the purpose of administering the Canada Transportation Act and related regulations. The Department of Transportation in New Brunswick performs a similar task in that province as well. The safety of Canada's roads is moderately good by international standards, and is improving both in terms of accidents per head of population and per billion vehicle kilometers. Air transportation made up 9% of the transport sector's GDP generation in 2005. Canada's largest air carrier and its flag carrier is Air Canada, which had 34 million customers in 2006 and, as of April 2010, operates 363 aircraft (including Air Canada Jazz). CHC Helicopter, the largest commercial helicopter operator in the world, is second with 142 aircraft and WestJet, a low-cost carrier formed in 1996, is third with 100 aircraft. Canada's airline industry saw significant change following the signing of the US-Canada open skies agreement in 1995, when the marketplace became less regulated and more competitive. Of over 1,800 registered Canadian aerodromes, certified airports, heliports, and floatplane bases, 26 are specially designated under Canada's National Airports System (NAS): these include all airports that handle 200,000 or more passengers each year, as well as the principal airport serving each federal, provincial, and territorial capital. However, since the introduction of the policy only one, Iqaluit Airport, has been added and no airports have been removed despite dropping below 200,000 passengers. The Government of Canada, with the exception of the three territorial capitals, retains ownership of these airports and leases them to local authorities. The next tier consists of 64 regional/local airports formerly owned by the federal government, most of which have now been transferred to other owners (most often to municipalities). Below is a table of Canada's ten biggest airports by passenger traffic in 2011. In 2007, Canada had a total of 72,212 km (44,870 mi) of freight and passenger railway, of which 31 km (19 mi) is electrified. [citation needed] While intercity passenger transportation by rail is now very limited, freight transport by rail remains common. Total revenues of rail services in 2006 was $10.4 billion, of which only 2.8% was from passenger services. In a year are usually earned about $11 billion, of which 3.2% is from passengers and the rest from freight. The Canadian National and Canadian Pacific Railway are Canada's two major freight railway companies, each having operations throughout North America. In 2007, 357 billion tonne-kilometres of freight were transported by rail, and 4.33 million passengers travelled 1.44 billion passenger-kilometres (an almost negligible amount compared to the 491 billion passenger-kilometres made in light road vehicles). 34,281 people were employed by the rail industry in the same year. Nationwide passenger services are provided by the federal crown corporation Via Rail. Three Canadian cities have commuter rail services: in the Montreal area by AMT, in the Toronto area by GO Transit, and in the Vancouver area by West Coast Express. Smaller railways such as Ontario Northland, Rocky Mountaineer, and Algoma Central also run passenger trains to remote rural areas. In Canada railways are served by standard gauge, 4 ft 8 1⁄2 in (1,435 mm), rails. See also track gauge in Canada. Canada has railway links with the lower 48 US States, but no connection with Alaska other than a train ferry service from Prince Rupert, British Columbia, although a line has been proposed. There are no other international rail connections. In 2005, 139.2 million tonnes of cargo was loaded and unloaded at Canadian ports. The Port of Vancouver is the busiest port in Canada, moving 68 million tonnes or 15% of Canada's total in domestic and international shipping in 2003. Transport Canada oversees most of the regulatory functions related to marine registration, safety of large vessel, and port pilotage duties. Many of Canada's port facilities are in the process of being divested from federal responsibility to other agencies or municipalities. Inland waterways comprise 3,000 km (1,900 mi), including the St. Lawrence Seaway. Transport Canada enforces acts and regulations governing water transportation and safety. several Sunshine Coast communities to the mainland and to Alaska. British Columbia to Alaska or Washington state. The St. Lawrence waterway was at one time the world's greatest[clarification needed] inland water navigation system. The main route canals of Canada are those of the St. Lawrence River and the Great Lakes. The others are subsidiary canals. The National Harbours Board administered Halifax, Saint John, Chicoutimi, Trois-Rivières, Churchill, and Vancouver until 1983. At one time, over 300 harbours across Canada were supervised by the Department of Transport. A program of divestiture was implemented around the turn of the millennium, and as of 2014, 493 of the 549 sites identified for divestiture in 1995 have been sold or otherwise transferred, as indicated by a DoT list. The government maintains an active divestiture programme, and after divestiture Transport Canada oversees only 17 Canada Port Authorities for the 17 largest shipping ports. Canada's merchant marine comprised a total of 173 ships (1,000 gross tonnage (GT) or over) 2,129,243 GT or 716,340 tonnes deadweight (DWT) at the end of 2007. Pipelines are part of the energy extraction and transportation network of Canada and are used to transport natural gas, natural gas liquids, crude oil, synthetic crude and other petroleum based products. Canada has 23,564 km (14,642 mi) of pipeline for transportation of crude and refined oil, and 74,980 km (46,590 mi) for liquefied petroleum gas. Some North American cities arranged by size along the horizontal axis and public transportation use on the vertical axis. Most Canadian cities have public transport, if only a bus system. Three Canadian cities have rapid transit systems, four have light rail systems, and three have commuter rail systems (see below). In 2016, 12.4% of Canadians used public transportation to get to work. This compares to 79.5% that got to work using a car (67.4% driving alone, 12.1% as part of a carpool), 5.5% that walked and 1.4% that rode a bike. in 2016, diesel buses were the leading bus type in Canada (65.9%), followed by bio-diesel (18.1%) and hybrid (9.4%) buses. Electric, natural gas and other buses collectively accounted for the remaining 6.6%. There are three rapid transit systems operating in Canada: the Montreal Metro, the Toronto subway, and the Vancouver SkyTrain. There is also an Airport Circulator, the LINK Train, at Toronto Pearson International Airport. It operates 24 hours a day, 7 days a week and is wheelchair-accessible. It is free of cost. Three cities have light rail systems—the Calgary CTrain, the Edmonton Light Rail Transit, and the O-Train in Ottawa—and Toronto has an extensive streetcar system. The 2016 Canada's Core Public Infrastructure Survey from Statistics Canada found that all of Canada's 247 streetcars were owned by the City of Toronto. The vast majority (87.9%) of these streetcars were purchased from 1970 to 1999, while 12.1% were purchased in 2016. Reflecting the age of the streetcars, 88.0% were reported to be in very poor condition, while 12.0% were reported to be in good condition. The standard history covers the French regime, fur traders, the canals, and early roads, and gives extensive attention to the railways. Prior to the arrival of European settlers, Aboriginal peoples in Canada walked. They also used canoes, kayaks, umiaks and Bull Boats, in addition to the snowshoe, toboggan and sled in winter. They had no wheeled vehicles, and no animals larger than dogs. Europeans adopted canoes as they pushed deeper into the continent's interior, and were thus able to travel via the waterways that fed from the St. Lawrence River and Hudson Bay. In the 19th century and early 20th century transportation relied on harnessing oxen to Red River ox carts or horse to wagon. Maritime transportation was via manual labour such as canoe or wind on sail. Water or land travel speeds was approximately 8 to 15 km/h (5 to 9 mph). Settlement was along river routes. Agricultural commodities were perishable, and trade centres were within 50 km (31 mi). Rural areas centred around villages, and they were approximately 10 km (6 mi) apart. The advent of steam railways and steamships connected resources and markets of vast distances in the late 19th century. Railways also connected city centres, in such a way that the traveller went by sleeper, railway hotel, to the cities. Crossing the country by train took four or five days, as it still does by car. People generally lived within 5 mi (8 km) of the downtown core thus the train could be used for inter-city travel and the tram for commuting. The advent of the interstate or Trans-Canada Highway in Canada in 1963 established ribbon development, truck stops, and industrial corridors along throughways. The Federal Department of Transport (established 2 November 1936) supervised railways, canals, harbours, marine and shipping, civil aviation, radio and meteorology. The Transportation Act of 1938 and the amended Railway Act, placed control and regulation of carriers in the hands of the Board of Transport commissioners for Canada. The Royal Commission on Transportation was formed 29 December 1948, to examine transportation services to all areas of Canada to eliminate economic or geographic disadvantages. The Commission also reviewed the Railway Act to provide uniform yet competitive freight-rates. Wikimedia Commons has media related to Transport in Canada. ^ "Transportation in Canada". Statistics Canada. Archived from the original on 2008-04-10. Retrieved 2008-03-26. ^ a b c "An Analysis of the Transportation Sector in 2005" (PDF). Statistics Canada. Archived from the original (PDF) on 2008-04-09. Retrieved 2008-03-27. ^ a b c "CIA - The World Factbook". The World Factbook. CIA. Retrieved 2011-01-13. ^ a b "Canadian Vehicle Survey: Annual" (PDF). Statistics Canada. 2009. Retrieved 2011-01-13. ^ a b c d Howe, C.D., the Right Honourable Minister of Trade and Commerce; Canada Year Book Section, Information Services Division Dominion Bureau of Statistics (1956). "The Canada Year Book 1956 The Official Handbook of Present Conditions and Recent Progress". Ottawa, Ontario: Kings Printer and Controller of Stationery. page 713 to 791. ^ Coneghan, Daria (2006). "Trans-Canada Highway". The Encyclopedia of Saskatchewan. Canadian Plains Research Center, University of Regina. Retrieved 2007-12-29. ^ Canadian Transportation Agency. "Regional Enforcement Officers". Canadian Transportation Agency. Retrieved 2007-10-01. ^ Ministry of Transportation. "Enforcement blitz improves road safety". Canada NewsWire. Archived from the original on 15 December 2005. Retrieved 2007-10-01. ^ "Motor Vehicle Safety Act". Archived from the original on 2007-12-28. Retrieved 2008-01-18. ^ "Highway Traffic Act". Retrieved 2008-01-18. ^ "Transport in Canada". International Transport Statistics Database. iRAP. Retrieved 2008-10-06. ^ "Travelog - Volume 18, Number 3" (PDF). Statistics Canada. Archived from the original (PDF) on 2008-04-09. Retrieved 2008-03-27. ^ Canadian Transportation Agency. "Enforcement". Canadian Transportation Agency. Archived from the original on 2007-09-22. Retrieved 2007-10-01. ^ "National Airports Policy". Archived from the original on 2007-11-21. Retrieved 2008-01-18. ^ Canada Flight Supplement. Effective 0901Z 3 January 2019 to 0901Z 28 February 2019. ^ a b "Airport Divestiture Status Report". Tc.gc.ca. 2011-01-12. Retrieved 2011-02-19. ^ "Airports in the national airports category (Appendix A)". Tc.gc.ca. 2010-12-16. Archived from the original on 2011-06-07. Retrieved 2011-02-19. ^ "Airports Council International Reports 2011". Archived from the original on 2013-11-01. Retrieved 2012-12-30. ^ "Calgary International Airport Local E&D Passenger Statistics1" (PDF). Archived from the original (PDF) on 2010-10-27. Retrieved 2010-05-04. ^ "Edmonton International Airport Enplaned and Deplaned Passengers 2010 Actual Compared to 2009 Actual" (PDF). Archived from the original (PDF) on 2011-07-11. Retrieved 2011-07-26. ^ Statistics Canada. "Rail transportation, length of track operated for freight and passenger transportation, by province and territory". statcan.ca. Statistics Canada. Archived from the original on 4 October 2008. Retrieved 2009-03-13. ^ "Railway carriers, operating statistics". Statistics Canada. Archived from the original on 2008-02-23. Retrieved 2008-03-26. ^ "AlaskaCanadaRail.org". AlaskaCanadaRail.org. 2005-07-01. Archived from the original on 2013-01-17. Retrieved 2011-02-19. ^ "Domestic and international cargo, tonnage loaded and unloaded by water transport, by province and territory". Statistics Canada. Archived from the original on 2008-03-29. Retrieved 2008-04-04. ^ Statistics Canada. "Vancouver: Canada's busiest port". Statistics Canada. Archived from the original on 6 July 2011. Retrieved 2008-04-09. ^ Transport Canada. "Small Vessel Monitoring & Inspection Program". Transport Canada. Archived from the original on 2007-09-13. Retrieved 2007-10-01. ^ Transport Canada. "Port State Control". Transport Canada. Archived from the original on 2007-10-14. Retrieved 2007-10-01. ^ Transport Canada. "Marine Personnel Standards and Pilotage". Transport Canada. Retrieved 2007-10-01. ^ Transport Canada. "Airport and Port Programs". Transport Canada. Archived from the original on 2007-11-11. Retrieved 2007-10-01. ^ "Marine Acts and Regulations". Transport Canada. Government of Canada. Archived from the original on 2008-01-15. Retrieved 2008-01-18. ^ AAPA (May 14, 2007). "North American Port Container Traffic 2006" (PDF). Archived from the original (PDF) on 19 December 2008. Retrieved 2009-03-23. ^ actionplan.gc.ca: "Strengthening Canada’s Port System"
^ "Ports". Transport Canada. Archived from the original on 2009-03-03. Retrieved 2010-02-02. ^ "Journey to work: Key results from the 2016 Census". Statistics Canada. 2017-11-29. ^ a b "Public Transportation Ridership Report - Fourth Quarter, 2016" (PDF). American Public Transportation Association. March 3, 2017. Retrieved May 15, 2017. ^ "2016 Transit Service Performance Review - Appendix E – SkyTrain and West Coast Express Line Summaries" (PDF). TransLink. 2016. pp. 4–8. Archived (PDF) from the original on July 27, 2017. Retrieved July 26, 2017. ^ Represents number of stops, per TTC website 2013 operating statistics. ^ "About Calgary Transit / Facts and Figures / Statistics". Calgary Transit. City of Calgary. 2015. Retrieved 2015-07-17. ^ "2013 LRT Passenger Count Report" (PDF). City of Edmonton. January 2014. Archived from the original (PDF) on February 21, 2014. Retrieved February 20, 2014. ^ "Quick Facts: Info to GO" (PDF). GO Transit. January 2014. Archived from the original (pdf) on July 14, 2014. Retrieved February 21, 2014. ^ GO by the numbers Archived 2009-01-05 at the Wayback Machine Retrieved on 2009-01-17. ^ a b Rodrigue, Dr. Jean-Paul (1998–2008). "Historical Geography of Transportation - Part I". Dept. of Economics & Geography. Hofstra University. Archived from the original on 2008-01-12. Retrieved 2008-01-18. McIlwraith, Thomas F. "Transportation in Old Ontario." American Review of Canadian Studies 14.2 (1984): 177-192.